The inside story of why Chiquita Brands CIO Manjit Singh ignored the SaaS FUD from the world's leading ERP vendors and, instead, chose an on-demand HR platform from upstart Workday to roll out to its global operations. The lesson: A bigger software vendor doesn't always equal a better ERP deal. It seems like a straightforward and simple question that your typical HR application and corporate ERP system should be able to answer: How many employees are working for our company today? Can Two Legacy ERP Guys Get IT Executives to Buy into On-Demand Applications? At Chiquita Brands, the Fortune 500 company best known for its blue-stickered bananas, "We couldn't answer that question," recalls Manjit Singh, Chiquita's CIO since September 2006. "It would take us a couple of weeks to get the answer pulled together and by that time, of course, it was all incorrect." Chiquita boasts a global workforce of 23,000 employees in 70 countries on six continents, though most of the workers are predominantly in Central America. Up until 2008, the Cincinnati-based food manufacturer had employed a hodgepodge of legacy HR systems that were inadequate at managing the complex demands of its decentralized workforce. Manual, inefficient workarounds (Excel spreadsheets and paper-based processes) were frequently used. When Chiquita hired a new employee, for instance, the HR paper-trail process could contain 20 to 30 steps, Singh notes. "At any point, if that paper gets lost, things are going to fall through the cracks," he says. "Many times new employees have shown up and haven't had an office, a PC or a phone. Obviously that causes pain to the employee, it doesn't make the employer look good, and you've lost productivity from the moment the employee walks through the door." 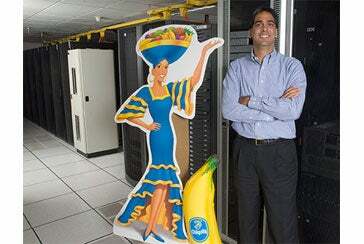 Chiquita needed an IT system overhaul and big business-process change. But just how much would that cost Chiquita, which had been battling to improve its profitability? Chiquita's 2008 results, for instance, missed analyst expectations—and its stock price tumbled after the company announced its earnings. While revenue reached $3.6 billion for 2008, Chiquita reported a net income loss from continuing operations of $325 million. In investor and financial analyst presentations, Chiquita executives stressed the themes of paying down outstanding debt, reducing inefficiencies and growing margins in product lines that will eventually lead to more analyst-friendly profitability. As a result, it wasn't an opportune time for an 18-month, multimillion-dollar ERP implementation of an HR app that needed to work as flawlessly in the offices of Cincinnati as it did in the jungles of Costa Rica. Both Chiquita's HR and IT departments knew what the company needed. "What we were looking for was a global HR system that could truly not just manage a database of employees but actually help us manage employees more effectively from a talent management, performance management and skillset perspective," Singh says. "And, oh yeah, adding payroll would be a 'nice to have' as well. That's how we started the journey." Which vendor could provide that system, and exactly how much that would cost, were less obvious at the outset, however. In early 2007, Singh and his staff started gathering HR system requirements. Several months later, he began a vendor-selection process with the usual Tier 1 enterprise software players. He declines to specify if those were Oracle and SAP, "but as a global Fortune 500 company," he says, "we only deal with the top-tier vendors."